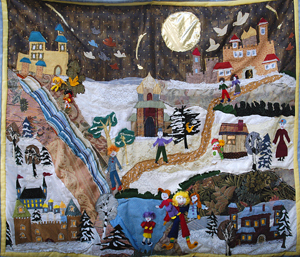 At this time of year, that story reminds me of the importance of helping our loved ones continue their traditions of giving, even if they are infirm, ill or disabled. This year, my Mum has not been well, so I made cheese balls which I wrapped with cards for her special friends and helpers. She is so happy to know that her friends will receive a Christmas gift from her that says not only, "You are one of my favourite people", but also, "I may need a lot of help these days, but I can still give too!" 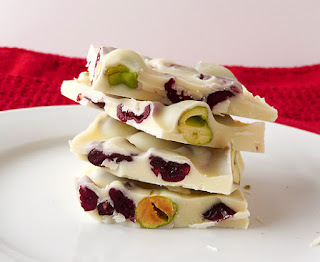 One of my favourite things to make and give with Nicholas is white chocolate bark candy. It's become a real tradition in our house and we all love it. It's so easy, but it looks gorgeous and when it's presented in clear plastic bags and tied with ribbon, it's a great gift that everyone is thrilled to receive. In bowl (plastic or glass), melt chocolate in microwave according to package directions. Stir in cranberries and pistachios. Pour onto foil-lined baking sheet; using palette knife or rubber spatula spread into 12- x 9- inch (30 x 23 cm) rectangle. Refrigerate for at least 1 hour or until hardened. Break into pieces. The hardest part of making this recipe is shelling the pistachios. My daughter Natalie loves this job though, and so do I. (We eat quite a few as we're 'working'!) It's just lovely to sit around the table and chat as we're shelling. Nicholas helps to stir in the cranberries and nuts. Of course, he's the official taster as well! I hope the loved ones in your family have the opportunity to give at this time of year. I would love to hear your stories of enabled giving and please do share your recipes if your gifts are edible!